​The dissolution of a marriage can be a traumatic experience. Your attorney or attorneys are well-aware of the emotional involvement of the parties. Though we are not behavioral specialists, we try to relieve your anxiety by attempting to assist in solving the problems that you face during this case. For us to properly represent you, it is necessary for you to give us all the facts concerning your case. We must also know your wishes. We welcome your viewpoints. Withholding information from your lawyer can affect the outcome of your case, so we advise you to be completely candid with us. Remember that a fiduciary relationship exists between attorney and client. We want to stress that although we will counsel and advise you throughout the case, the final decisions regarding your case must be made by you. 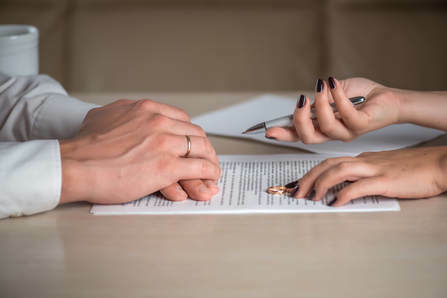 Our experience has shown that most divorce cases are settled, which means that the parties reach an agreement that is placed on the court's record. ​NEVER AGREE TO SOMETHING YOU DO NOT UNDERSTAND OR TO SOMETHING YOU FEEL YOU ARE FORCED TO AGREE TO. YOUR CONSENT TO AN AGREEMENT MUST BE VOLUNTARY, AFTER CONSULTATION WITH YOUR ATTORNEY. ​After an agreement is placed on the record, it is extremely difficult and sometimes even impossible to change it. As your representatives, we are here to advise and inform you, cite the options and alternatives available to you, process your divorce matter, assist you in decision-making, and cooperate with you in attempting to obtain the best possible results on your behalf. Michigan is known as a "no-fault" divorce state; however, the words "no fault" can be misleading. If the parties reach a final settlement on all issues, fault is not a factor. If there is a dispute about property, child or spousal support, parenting time or custody, fault may become an active ingredient in resolving these issues. For this reason, your attorney may go over the indiscretions of the parties with you. Navigating the important decisions that must be made during this stressful time is challenging. I understand what you are experiencing and work to relieve as much of that stress as possible by reaching practical solutions without the need to litigate. Doing so puts more control of the outcome in your hands and typically reduces the costs involved. I am accepting new clients throughout Genesee County and neighboring Central Michigan Counties from my office in Grand Blanc, Michigan. Do not hesitate to call 810-516-5116 to schedule a consultation. I will provide a candid assessment of your situation and recommend an effective course of action.